The CoffeeShop Blog: Gloomy, Rainy, and Cool Edit!!! Gloomy, Rainy, and Cool Edit!!! Today in Texas we are getting caught up on our months of drought in just a day or two. Typical... So today we have gloomy weather and potentially lots of flooding. Luckily our house is pretty high so we should be fine as long as our hail-damage roof doesn't start leaking. I knew I should have gotten that taken care of earlier. I am such a procrastinator. 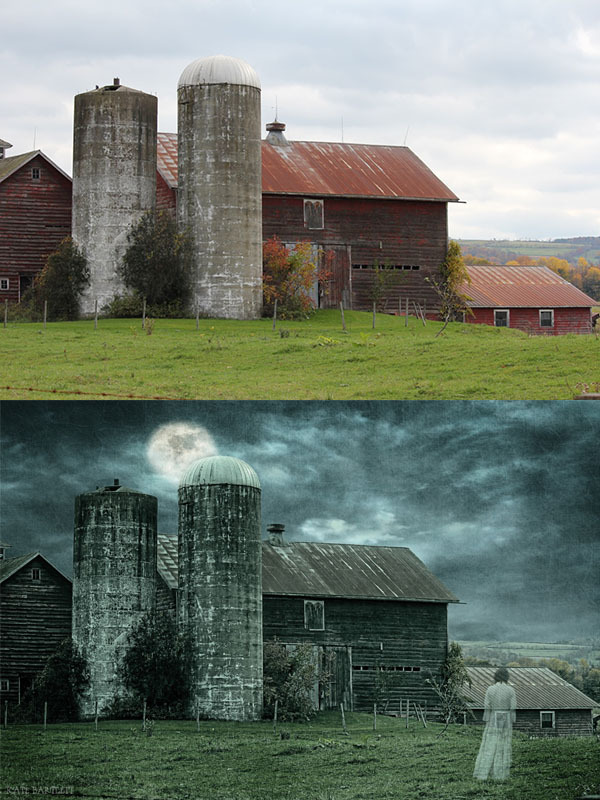 I am working on a beautiful new action that comes out tomorrow for your colorful Autumn images, but today I wanted to share this amazing edit Kate sent me using my "Dark and Eerie Night" editing kit. The original image is her own and I absolutely love how she edited it. The ghost was a perfect addition. Those of you getting these crazy rains, please stay high and dry. Nice job, Kate & Rita! So perfect and scary for Halloween! I love Kate's edit, she is so talented!